Heat a large cast-iron skillet over medium-high heat. Add the sausage, break it up with a wooden spoon or spatula. Cook until well browned and cooked through, about 7 minutes. Using a slotted spoon, transfer the sausage to a bowl, leaving rendered fat in the skillet. Whisk flour into the fat and cook, stirring, for about 1 minute. While continuing to whisk, pour the milk into the skillet and bring the gravy to a boil. Lower the heat and simmer gently for 2 minutes or until gravy is thick and bubbly (if too thick add more milk as needed). Stir in the sausage and season with salt and pepper. 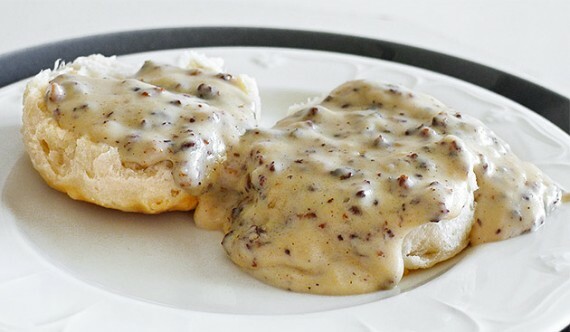 Split the biscuits in half and top each half the gravy. Serve immediately.